Maritzburg United attempt to build momentum from their midweek win over Orlando Pirates when they welcome AmaTuks to the Harry Gwala Stadium tonight, Friday 5 December, 20H00. The Team of Choice will also be looking to hit back from their last result in PMB, which saw them going down 2-1 to two late Moroka Swallows goals. Maritzburg have so far taken 11 points from their six home games this season, and are sitting in fourth position on the standings with 20 points from 13 matches. Tuks (position 14, with 13 points) meanwhile have done fairly well on the road this season, losing just two of seven games and picking up nine points on their travels. The Tshwane side head into the game on the back of a 2-1 midweek defeat to AmaZulu. 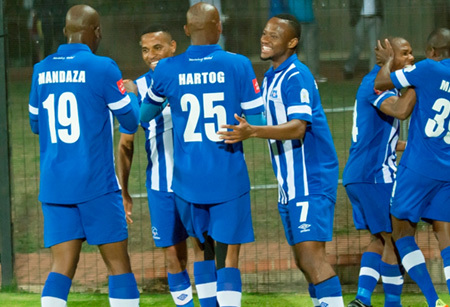 Maritzburg have never lost to the University of Pretoria in the league – in four previous matches there have been three draws and one win for the KZN club. United have however not yet recorded a win over Tuks at home. Maritzburg’s line-up from their 2-1 win over Pirates: Vries, Mabaso, Banda, Paintsil, Hartog, Sekotlong, Cele, Vilakazi (Mngonyama 76’), Awal, Anas (Mandaza 61’), Mkhize (Lentjies 81’). Tuks’ line-up from their 2-1 loss to AmaZulu: Arubi, Ntombayithethi, Kekana, Jaure (Monyai 86’), Shoyisa, Ngubane, Matsi, Zwane (Massa 59’), Mosadi (Mathosi 59’), Mnyamane, Nyondo.